Good morning! So with my 100 mile bike ride just around the corner, I thought this Nissan spot featuring Lance Armstrong was fitting. TBWA ChiatDay of Los Angeles was behind this spot advertising Nissans new tailpipe-less Leaf vehicle. Even more fitting is the fact that I recently watched the documentary "Who Killed the Electric Car?" which was about how electric cars were all the rage when they were first introduced in 1995 but oil and car companies were quick to shut down the project. Probably should have continued or jumped on the bandwagon then, imagine how successful they may have been these days with everyone trying to become as environmentally friendly as possible. 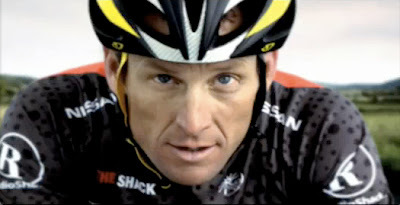 The Nissan spot uses Lance to feature the new car by saying that during his career he has always biked behind cars with a tailpipe but with the new Nissan Leaf, he doesn't have too! To be honest with you, it is kind of a corny idea, and Nissan could have chosen another direction to tout its new electric vehicle but I guess this will do for now. Also...not to be too picky but I'm pretty sure he is still going to be behind a bunch of cars with tailpipes unless he is so fortunate that he only rides behind Nissans haha. I figured I would throw that in there. What do you think? Do you like the idea of using Lance?